On February 13th OPPD posted an update on their website about the utility’s proposed community solar program, including background information, proposed program highlights, and information on how a participant’s monthly solar charge would be calculated. Provide your comments on the proposed community solar program at OPPD Listens. 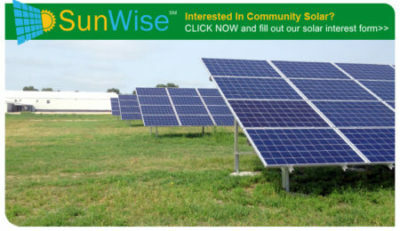 SunWise is a community solar program available in participating Nebraska Public Power District retail communities. Eligible customers have the opportunity to use solar energy to partially power their homes and businesses without the need to invest in a rooftop or home-based system. Scottsbluff – Pilot project fully subscribed. NPPD and the City of Scottsbluff are now working on a 5-megawatt project. Customers living in other communities served by NPPD may request community solar for their town or city by submitting the online form available at the link, below. NPPD serves 80 communities throughout Nebraska. Request community solar in your community. Generating 5 megawatts of solar energy, the LES community solar facility is the largest and first utility-scale solar installation in Nebraska, as well as one of the largest in the region. Participate in the LES community solar program. Online dashboard with live data and details about the community solar facility. The project was developed by Enerparc, and LES contracted for all energy produced by the facility. The installation, located at Northwest 75th and West Holdrege streets, uses 15,333 solar panels to produce enough energy to power 900 typical homes in Lincoln. Enerparc began construction in March 2016, and the solar facility went online in June 2016. At the time of its completion, over 1,200 residential and business customers voluntarily contributed funds through the LES SunShares program to help support a portion of the facility. This entry was posted in Community-Scale Solar, NewsBlog and tagged community solar development in Nebraska, LES SunShares Community Solar, Nebraskans for Solar's NewsBlog, NPPD's SunWise Community Solar, OPPD's proposed community solar, Resources for Nebraska Communities Considering A Community Solar Program, utility-scale solar in Nebraska communities on February 22, 2018 by Helen Deffenbacher.